I know a few teaching writers — a lot, if I’m honest — who have often bemoaned their composition courses. They understand the necessity of composition courses and don’t mind teaching them from time to time, but (these writers sometimes confess to me) they would much rather be teaching advanced literature or creative writing. I don’t blame them. I, too, love teaching literature and creative writing. But I also love teaching composition, from developmental courses onward, and I think these classes I teach have as much to do with my work as a writer as do my literature and creative writing courses. I have been hard at work these past couple of weeks composing syllabi for my composition classes at my community college. One was easy enough to pull together because it’s simply an update of a course I taught last year. But a second of these took several days to work out because I am revamping the course from scratch and using a new textbook. And the third course took only a weekend but required a lot of intensive work because it was a last-minute addition to my schedule — and it, too, is using a completely new textbook and some fairly dramatic updates of old assignments. So, on the balance, I’ve been doing a lot of work on these classes, and by now I should feel mentally exhausted. In fact, the opposite is true. I feel energized, eager to get into the classroom and meet my students and put these courses into motion. The thing about teaching these writing classes that I love so much is that it requires me to think more intensely and more mindfully about the craft of writing. True, I am a fiction writer by trade, and even considering those rare instances when I teach the narrative essay, the work in these classes has little outward relationship with my own writing. But preparing these classes makes me consider, in a highly organized way, what it is I do when I sit down to put words on a screen. It’s amazing how many websites use this quote to try to sell stuff. I finally had to make my own meme. 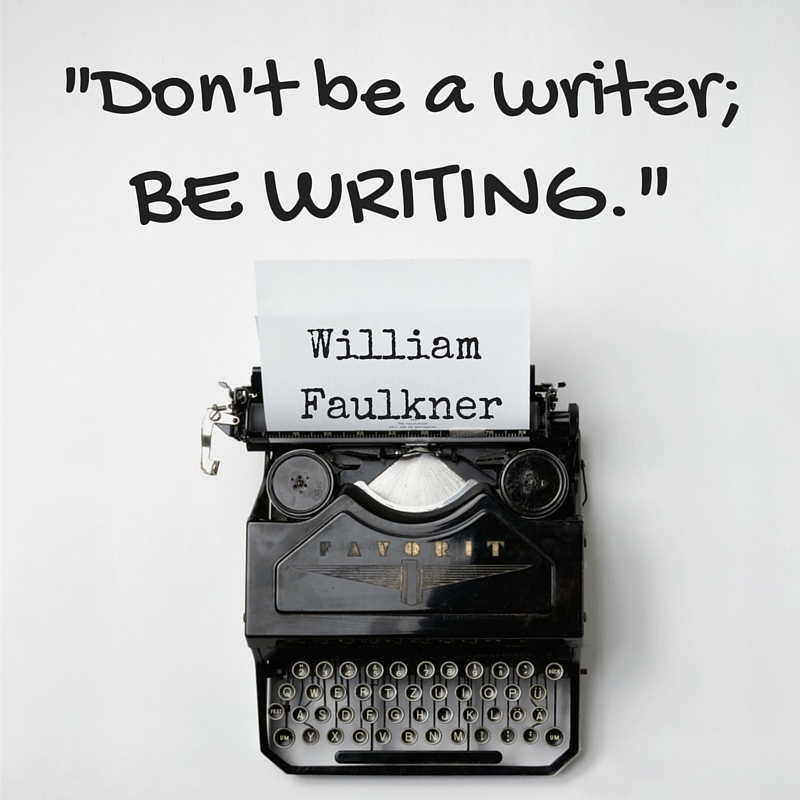 There’s a quote attributed to Faulkner that turns up on my social media from time to time: “Don’t be a writer; be writing.” I appreciate the quote and often need it as a personal reminder, but (sorry, Faulkner) sometimes it does me tremendous good to step back from the writing and think about what it is to be a writer. To get my ducks in a row and understand what it is I’m doing when I am at the writing. It’s the kind of thing I’m working on when I plan or outline a novel, arrange the plot points and devise the characters and considered the structure. Not just what I’m trying to say but why I’m saying it and, therefore, who I am to be saying it. And that’s almost precisely what I’m doing when I work on syllabi: I am arranging the plot points of my course, considering the characters of my students, and thinking about how the structure of the class will help shape the story we all collectively tell each other in that classroom. Who we are as writers, as learners. And that process excites me. This return to my beginner’s mind (to borrow from Natalie Goldberg), this codified insistence that words matter, that sentences matter, that structure matters, that audience matters that identity matters — this serves me at least as well as it might serve my students. And in this way, my students teach me as much as I teach them. In my Buddhist practice, my teachers have a habit of greeting every Sunday teaching and every weekend seminar and every retreat with an expression of gratitude for their students. “Thank you for being here,” they tell us. “Your presence makes my attention to this subject possible.” Always something along those lines. And they mean it. My teachers are so sincere in their gratitude for us students just being there. It’s a habitual expression I have taken up myself, and I try to greet my students this way, if not every day then at least on the first day of each term, because I mean it: I am so profoundly grateful that their presence in that classroom has provided me this opportunity to reconsider all over again what it is I do in my writing, who I am as a writer. These students are the reason I keep coming back to the classroom, not because I have any particular wisdom to impart but because I am so eager to share with them this practice we’re all engaged in — this academic and creative story we’re all telling each other together. And so these syllabi I write, they conform (as much as they have to) to the prescriptions of the state and the school and the academic field we all are engaged with, but they also — primarily — are guidelines for us writers. My students and me. We’re all at the same desks, all staring as the same blank pages, all wondering where to begin. And in that respect, these syllabi are as much a guideline for my work as theirs. And I find that exhilarating. I have never forgotten your answer to the question about whether it was possible to ‘teach’ writing.